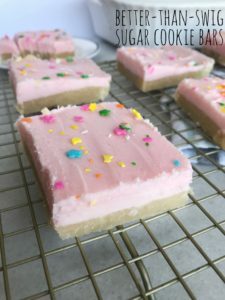 These cookie bars are a favorite around our house. 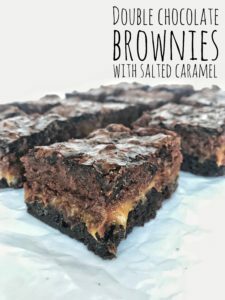 They’re super quick, just mix and dump into a pan, and bake. They’re super versatile and they always turn out perfectly! I always find myself making these right after Halloween with all the leftover candy I have. But these are not limited to Halloween and are wonderful year round. Feel free to use any kind of mix-ins you like! I used a mix of Reese’s peanut butter cups, Hershey’s milk chocolate with almonds, Snickers, and semisweet chocolate chips. I make these regularly with just chocolate chips too if you don’t have any candy lying around. Don’t like coconut? Replace your 2 cups of shredded coconut with an additional 1½ cups old-fashioned oats. Preheat oven to 350 degrees Fahrenheit. In a large mixing bowl combine melted butter, 1 cup brown sugar, and granulated sugar. Once combined, add in eggs, and vanilla. Stir in flour, baking soda, and baking powder until just combined. Then stir in shredded coconut and quick oats, and mix ins (I reserved some mix-ins to sprinkle on top). Spread batter into a greased 9x13 pan until evenly disturbed. Bake for 23-25 minutes, Cool completely before serving.